Re-Reading Sappho reflects the recent fascination with Sappho's "afterlife." The essays examine the changing interpretations of scholars and writers who have read the fragmentary remains of Sappho's poetry. As the contributors explore the ways that each generation creates its own Sappho, the Sapphic tradition itself becomes an index to changing sensibilities and cultural norms about sexuality, gender roles, and notions of fema le authorship. A legendary literary figure, Sappho has attracted readers, critics, and biographers ever since she composed poems on the island of Lesbos at the close of the seventh century B.C. 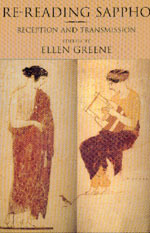 Bringing together some of the best recent criticism on the subject, this volume, together with Reading Sappho, represents the first anthology of Sappho scholarship, drawing attention to Sappho's importance as a poet and reflecting the diversity of critical approaches in classical and literary scholarship during the last several decades. Ellen Greene is Associate Professor of Classics at the University of Oklahoma.